On Tuesday the 13th of February I had the great pleasure of watching Puccini’s Madama Butterfly at the Cliffs Pavillion in Westcliff- On-Sea. I’m not a newbie to opera as my partner is a huge fan, but I admit I am more at home watching a west end musical or play. So I was pleasantly surprised when the curtains raised and a beautiful Japanese garden had adorned the stage. The sound of trickling water was a lovely touch to this staging and I heard a lot of people comment on the impact that it had on setting the scene. The story starts with an introduction to the characters of Lietuenant B.F Pinkerton and the American Consul. They are in a traditional Japanese garden, and through their melodic conversation, over a glass of whiskey, we learn that B.F Pinkerton has bought the house and a Geisha wife who is aptly named Madame Butterfly. During the first half of the show we see B.F Pinkerton and Cio-Cio San (Madame Butterfly) both madly in love, and ready to defy the odds. As an audience member we are drawn into their love story, and as the curtain falls on Act One there is a sense of peace in the auditorium. There is a collective sigh as the curtain rises on Act Two and the audience settle themselves for another hour of the beautiful Italian language of love. However it is not to be. Although everything looks the same as before, we quickly learn that B.F Pinkerton has been away for 3 years and his wife has been cruelly discarded. The story then spirals out of control with a truly devastating end. The lighting on this show was absolutely superb. Especially during the famous “Humming Chorus” where we see the slow change from dusk to dawn as Madame Butterfly holds a vigil to wait for her long lost husband. The lighting change was so subtle that it didn’t take away from the score and added desperation to the scene that left the audience holding their breath with Butterfly for his return. However as always it is the truly talented performers that make this show. Maria Heejung Kim steals the show as Madame Butterfly. Her vocal range is incredible as it filled the auditorium. Her training shone through as she cleverly transitioned from almost a whisper to a belt so strong that you were left with goosebumps. Her acting should also be commended as it merged perfectly with her singing and neither pulled focus from the other. Giorgio Meladze who played the shameful B.F Pinkerton had such a rich voice that it was almost a shame that we did not get to hear more of it. Although this may have made me enjoy it more, a bit like dark chocolate, the more you have of it the less you enjoy it. All in all I would say this is a perfect opera for beginners; it flows well and keeps your attention throughout. Also, judging by the mix of tears and smiles on people's faces, I think that Tuesday night’s audience would certainly agree with me, that this was a truly wonderful production. 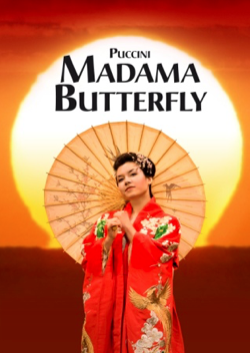 Madama Butterfly is Puccini’s popular tale which the hit West End musical Miss Saigon is based. One of the world’s most popular operas, Puccini’s Madama Butterfly tells the heart-breaking story of the beautiful young Japanese girl who falls in love with an American naval lieutenant – with dramatic results. Highlights include the melodic Humming Chorus, the moving aria One Fine Day and the unforgettable Love Duet. With exquisite sets including a spectacular Japanese garden and fabulous costumes including antique wedding kimonos from Japan designed by the renowned Russian designer Felix Bessonov, from St Petersburg. International Korean soprano Maria HeeJung Kim from the National Opera House of Seoul will be making her debut in the UK singing the role of the tragic Cio Cio San. HeeJung Kim, the talented young star studied in Milan and has made her debut as Madama Butterfly at the Milan Opera. HeeJung Kim has sung Madama Butterfly and La Traviata at major Opera Houses in Europe. Alyona Kistenyova, the international soprano from Odessa National Opera will be returning after her critically acclaimed performances of Aida, La Boheme, Carmen, Tosca and Die Fledermaus. Ruslan Zinevych will be returning to sing Pinkerton. Zinevych has previously sung with Pavarotti and was highly praised in the UK singing the performances of La Traviata, La Boheme, Carmen, Tosca, Die Fledermaus. Making his debut as Pinkerton in an Ellen Kent production is the Ukrainian tenor Vitalii Liskovetskyi from the Kiev National Opera. Liskovetskyi, originally trained as a military pilot, has made his debut on an Ellen Kent tour in 2015 in Carmen and Tosca, followed by a huge success in Aida, La Boheme and Nabucco. Giorgio Meladze, the Spanish tenor, is invited to open the tour at Bristol Hippodrome, after a succesful tour of Aida, La Boheme and Nabucco and will be singing the parts of Pinkerton and The Duke of Mantua in Rigoletto. Zara Vardanean, the American mezzo-soprano, trained at the Vienna State Opera, returns to sing the part of Suzuki. The operas will be conducted by Vasyl Vasylenko, who is the artistic director and conductor at the National President's Orchestra of Ukraine, Kiev, and the guest conductor and artistic director of the National Opera of Moldova, Nicolae Dohotaru. With 30 members of the National Ukrainian Orchestra. Madama Butterfly – the heart-breaking story of the beautiful Japanese girl, who falls in love with an American naval lieutenant, resulting in heart wrenching drama. This magnificent production boasts beautiful sets and costumes and a large live orchestra. Highlights of the performance include the melodic Humming Chorus, the moving aria One Fine Day and the unforgettable Love Duet. As with any of Ellen Kent’s shows all of the soloists have been hand-picked and directed by Ellen to create a visually beautiful and moving production of Madama Butterfly.